With its silver screen vibe, July/August is our Summer Blockbuster issue. These mystery stories share important traits with the movies: the tales are vivid and visceral; clever writers direct the reader’s focus; and the narratives manipulate perceptions to build drama and suspense. We’re pleased to present our 11th annual Black Orchid Novella Award winner: Mark Thielman’s “The Black Drop of Venus” features Captain James Cook playing the ratiocinative sleuth on board HMS Endeavour. This issue we welcome two new authors, Rebecca Cantrell and Meredith Frazier, as we sadly say goodbye to two of our favorite authors, Robert S. Levinson and Albert Ashforth. Bob Levinson was a movie lover and a fixture in the music industry in Hollywood; he wrote with insight and sympathy about the characters in and around the industry and city. He had a knack for hearing the crazy inner voices that propelled his characters, and conveyed that in his tales. Albert Ashforth, always a quiet, friendly face in New York mystery circles, wrote about US army retired special investigator Alex Klear in stories that captured the complexity of the operative’s mind as well as the world he worked in. Rebecca Cantrell’s historical novels featuring Hannah Vogel are set in 1930s Germany and have won multiple awards and nominations. She also writes a humorous PI series and a thriller series set in the tunnels of New York City, and she cowrites with James Rollins The Order of the Sanguines series that blends myth and history into a thriller. 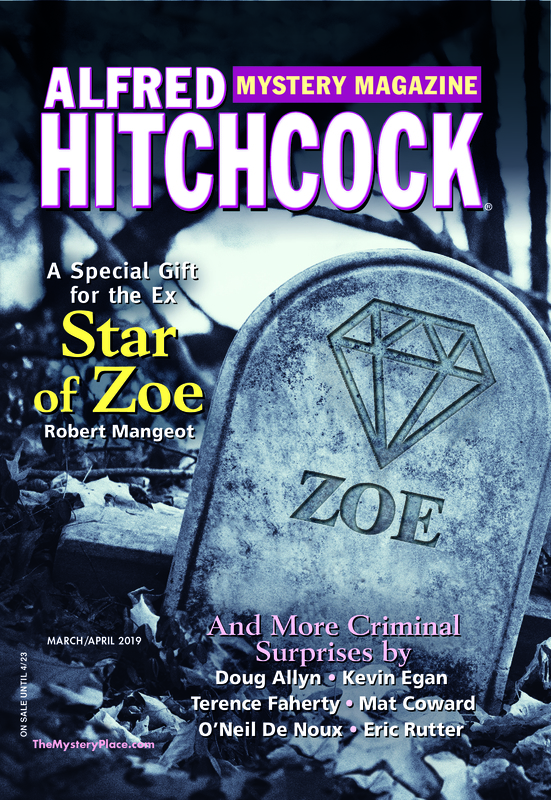 Meredith Frazier’s first published story appeared in our sister publication, Ellery Queen’s Mystery Magazine. So get ready to fire up the cinema of the mind’s eye. What could be more appropriate for a magazine named after a famous film director?